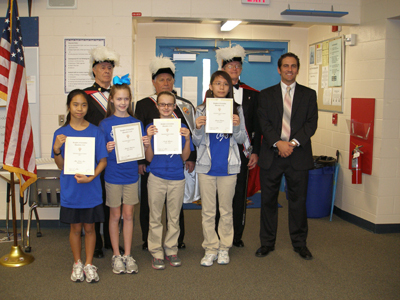 On Friday, December 2, three members of the Color Corps of the Knights of Columbus presented awards to the winners of the Patriotic Essay Contest on the morning show at Bonita Springs Middle School. The Patriotic Essay Contest is sponsored by the 4th Degree Knights, the patriotic order of the Knights of Columbus, particularly by Assembly #2542 located in Bonita Springs. This was a joint effort with Principal Linda Mitchell, and the combined Language Arts and Social Science faculties. The project was headed by Language Arts instructor Kenner Muench. Each of the winners received a personalized award certificate as well as monetary consideration. 1st place:$100, 2nd place:$60, 3rd place:$40. Finalists each received a McDonald’s gift card. Front Row Left to Right: Nicole Patel, Blake Gilliland, Cory Kolbe, Chelsea Heil. Back Row: Sir Knight James Ripley, S/K Patrick Becker, S/K Edward Sedillo. Appearing in the other above photo is 1st place winner Nicole Patel and Assembly 2542 Faithful Navigator Edward Sedillo. On Tuesday, November 29, the Knights of Columbus presented awards to the winners of the Patriotic Essay Contest on the morning show with Assistant Principal Ryan Nemeth at North Naples Middle School. The Patriotic Essay Contest is sponsored by the 4th Degree Knights, the patriotic order of the Knights of Columbus, particularly by Assembly #2542 located in Bonita Springs. This was a joint effort with Principal Margaret Jackson and the instructional staff, and the project was headed by Jennifer Lazar, Language Arts Department Chair. As it does every year, the Knights developed a patriotic-themed topic for the subject of the essay contest, and this year was the Thomas Jefferson quote: “Patriotism is not a short frenzied burst of emotion, but the long and steady dedication of a lifetime.” The students were asked to develop the topic in a 300 word composition. Each of the winners received a personalized award certificate as well as monetary consideration. 1st place:$100, 2nd place:$60, 3rd place:$40, 4th and 5th place each received a McDonald’s gift card. Veterans Day in the courtyard tent of Royal Palm Academy in North Naples was the scene as students and their grandparents, staff, and faculty gathered in a special patriotic ceremony honoring veterans and grandparents. Special guests included the 4th Degree Knights of Columbus from Our Lady of the Rosary Assembly #2542 located in Bonita Springs. 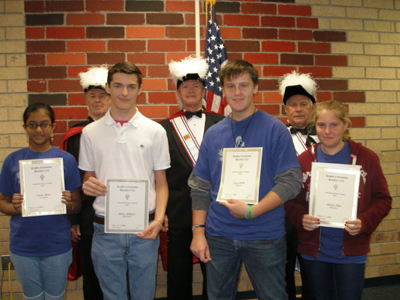 Three members of the Color Corps of the Assembly presented awards to writers of the top five student essays for the Knights-sponsored patriotic essay contest in the 2011-2012 school year. The essay contest was a joint effort with the staff and faculty of Royal Palm Academy headed by principal Dr. Margaret Richardson and was co-ordinated by Dean of Students Scott Baier. Karen Evans assisted in the arrangements. This year’s patriotic-themed topic for the subject of the essay contest was the Thomas Jefferson quote: “Patriotism is not a short frenzied burst of emotion, but the long and steady dedication of a lifetime.” The middle-school segment of students of Royal Palm Academy developed the theme into a 300 word essay. Each of these writers received a personalized award certificate as well as monetary consideration. 1st place: $100, 2nd place:$60, 3rd place:$40. Finalists each received a McDonald’s gift card. Appearing in the above group photo (taken by Pedro Reyes) are:Left to Right(front row): Serena Kauffman, Maximilian Kirk, Noelle Torres, Rachael Rich. Left to Right(rear row): Sir Knight Phil Vullo, S/K Jim Brennan, S/K Patrick Becker.